On the heels of a landmark visit to Kenya and Ethiopia, where President Barack Obama declared “Africa is on the move,” he honed the message, this time to 500 young leaders visiting from sub-Saharan Africa. “The continent has archived historic gains in health from fighting HIV/AIDS to making childbirth safer for women and babies. Millions have been lifted from extreme poverty. So this is extraordinary progress,” Obama said. The president urged the Mandela-Washington fellows of the Youth African Leaders Initiative to build on the progress Monday in Washington. The fellowship, which President Obama announced during his 2013 trip to South Africa, this year connected the young leaders to 20 U.S. universities, where they spent six weeks expanding their skills in everything from entrepreneurship to civic affairs. “Our hope is that 10, 15, 20 years from now, when you have all gone on to be ministers in government or leaders in business or pioneers of social change, that you will still be connecting with each other, that you will still be learning from each other and that, together, you will be reaching back and helping the next generation,” President Obama said. YALI fellow Nana Diaby runs a communication agency in Mali. She told VOA her time at Notre Dame University gave her a better understanding of true leadership. “In Africa, people really need an education. We realized they do not know too much about leadership. And the dark side [of leadership] we see in Africa is that a president can [serve] for 25 years, so that is incredible,” Diaby said. African leaders refusing to step aside, despite their terms ending, was an issue President Obama spoke about during his July 28 speech to the African Union in Ethiopia. In those remarks, he also called for the empowerment of women and girls, a point he reaffirmed Monday. Attendees cheer as U.S. President Barack Obama (not pictured) arrives onstage at the Young African Leaders Initiative (YALI) Mandela Washington Fellowship Presidential Summit in Washington, August 3, 2015. 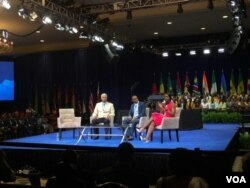 At the Washington summit, President Obama announced up to 80 Americans will be traveling to Africa next year, in a reverse exchange, to work with Mandela-Washington Fellow alumni and other young Africans. He noted the fellowship will also double the number of participants, with up to 1,000 young Africans traveling to the United States in 2016. The White House says about 140,000 members of the YALI network have access to online courses, including guidance on how to start a business. 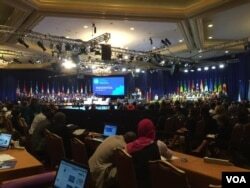 The U.S. leader also announced the opening of a YALI Leadership Center in Ghana, joining an existing center in Kenya. Two other centers in South Africa and Senegal will open by the end of this year, with all four spaces helping train 3,500 young Africans each year.